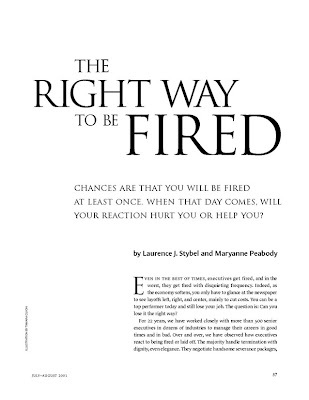 mind the gap: HBR: "The Right Way To Be Fired"
HBR: "The Right Way To Be Fired"
NO EMPLOYMENT CONTRACT HAS A PERMANENCY CLAUSE. The category "permanent employee" is only to differentiate one from temps - both remain time-bound nonetheless. There may be a clause in the employment contract talking about retirement age of an employee, and rather misleadingly, that might go on to give an impression to the newly joined that her job is secure and permanent until the age of say 60 years. However, in reality that section of the employment terms is just another clause suggesting when would you be required to leave your present job. As the "globalization" story propagates to more and more regions and industries, it is getting increasingly important, especially to the optimistic lot like myself too young for that retirement age yet, that the realities of the impermanent nature of jobs and employment be realised, the sooner the better, such that one can make a more informed and rewarding career planning. They also call it acting "professional". In essence, an organization employs personnel because and until it requires them. Unlike perhaps government jobs, no organization is obliged to continue an employment on a sort of permanent basis. It has never happened in the history of employment. The primary function of a Human Resources department is thus to create a comfort-zone called 'sense of permanency' where there may not be any for real. Job cuts, Pink slip, Resignation, Hire/Fire, and Layoffs are rather harsh words in the politically correct arena of corporates and employment, but they are as relevant and real as the pay cheque; and that is why the top career planners and advisory firms counsel with their clients to have what is called a "severance contract" embedded within the job offer-letter itself. At the risk of having an anti-climax or feeling counter-intuitive for having to talk about separation formalities while discussing joining details, Maryanne Peabody and Dr. Laurence J. Stybel, after 22 years of research and working with more than 500 top executives, argue that "it's your best hedge against a bitter exit" and would come to one's rescue in so many ways when things get "uncomfortable". The case in point: prenuptial agreement that protects both sides, and the face-saving usefulness it has shown over the years. When the employees who hold the tenure mind-set are suddenly laid off, they can fall into three common traps: "lost identity" trap - executives who have over-identified with their jobs and feel indispensable fall into this trap and react to termination with anger and bitterness; "lost family" trap - employees who posses tight-knit, emotional bonds with co-workers feel betrayed and rejected when fired; "lost ego" trap - some introverted executives fall into this trap and they quietly retreat without negotiating termination packages. As in almost all walks of life the key has been identified as Mind Gap. The paper is very well illustrated with real-life examples and handles the delicate issues with required gentleness as well as practical wisdom. Whilst the situation of job loss is almost a daily news in the high-cost and profit-centric regions, the so called low-cost locations are also catching up, for every organization would want to replicate itself albeit at a smaller scale when it creates presence in the low-cost region, and in doing so also clones its HR policies. Going through the Pink-slip tales and their economic ramifications one can not help but have the sense of living dangerously in the contemporary corporate environment. Along with the suggested mitigation strategies in the paper, I noticed "impermenance" being mentioned at least once on each and every page. And I could not help but carry the reference further to the premise called Three Marks of Existence in Buddhism where anicca (impermenance) is one of them. Jobs belong to the organizations, but careers belong to the individuals. Update: HBR ran a cover story - The layoff - in their March' 09 issue. Go here for the online copy. Go here for a relevant story by Y! 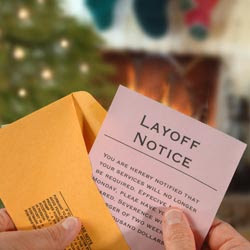 news: "Executives afraid to take holidays in case 'they lose jobs'"